1 Preheat oven to 180C. Whisk eggs, sugars and half the vanilla seeds on high speed in an electric mixer until mixture is tripled in volume and holds a trail (10-12 minutes). Transfer to a large bowl, sift over flour and baking powder in two batches, gently fold to combine, then fold in butter. Divide among 4 buttered and floured 20cm-diameter cake tins lined with baking paper on the bases and bake, swapping tins halfway through cooking (see note), until cakes are dark golden and centres spring back when gently pressed (15-20 minutes). Cool slightly in tins, then turn out and cool completely on a wire rack. 2 Meanwhile, for caramel pears, combine sugar, rinds, juices, spices, vanilla bean and seeds and 1 litre water in a large saucepan, stir over medium-high heat until sugar dissolves. Add pears, cover closely with a round of baking paper, weight with a plate and bring to the simmer. Reduce heat to medium and cook until just tender (20-25 minutes). Remove pears from liquid (set aside), then strain cooking liquid into a large deep-sided frying pan and simmer over medium-high heat until mixture turns caramel (25-35 minutes). Add dessert wine, cream and butter (be careful as hot caramel may spit), then stir until combined. Add pears to pan and cook, spooning caramel over pears until glazed (2-3 minutes), then set aside. 3 Whisk crème fraîche, cream, icing sugar and remaining vanilla seeds in a bowl until firm peaks form (2-3 minutes). Refrigerate until required. 4 To serve, place one cake on a serving plate, spread with a third of the crème fraîche mixture. Repeat with remaining cakes and crème fraîche mixture, finishing with a cake. 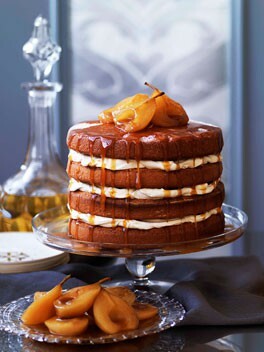 Dust with icing sugar and serve with caramel pears and syrup. Note If you don’t have four 20cm cake tins, or your oven isn’t large enough to cook all the cakes at once, make and cook half a batch of the cake mixture at a time. This recipe is from the August 2010 issue of Australian Gourmet Traveller. Drink Suggestion Young Rutherglen muscat.